In which parts of the world can we find the most innovative developments in mobile products? 8 from Western Europe (Amsterdam, Austria, Barcelona, Berlin, Edinburgh, London, Milan, and Munich). 2 from Western Europe (fonYou and Layar). But another way to answer this question is to look at the view of the influential publication Fast Company. They’ve just published a list of the world’s ten most innovative companies in the mobile industry. What kind of geographical breakdown would you expect in Fast Company’s list? 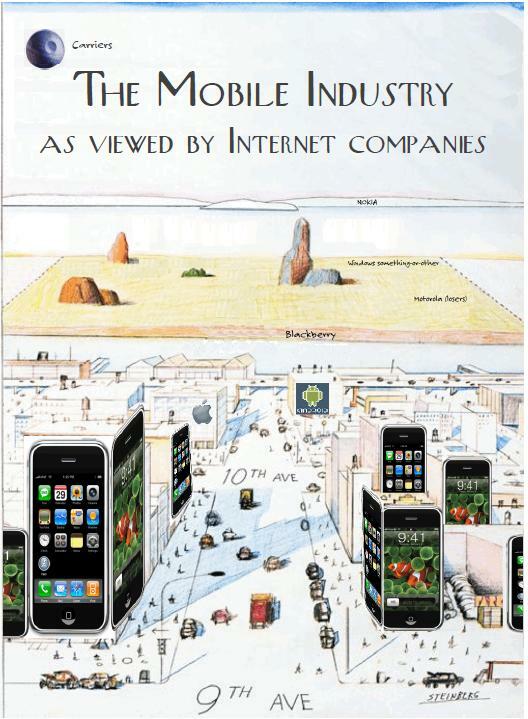 Google, Apple, Amazon, Ford, Evernote, Qualcomm, Clearwire, Foursquare, Intermap. The lion’s share of the greatest mobile innovation really is happening in the USA, and the rest of the world should wake up and recognise that fact. If the third explanation is the right one, perhaps I should seek my next employment in the US. Footnote: Thanks to Petteri Muilu for drawing my attention to the Fast Company list. I said something similar on my blog Saturday (for different reasons), very consistent with the Rubicon-Steinberg drawing. However, I think the rest of your metric is a bit overblown. Yes, Fast Company is not a mobile phone publication but a Silicon Valley publication, and thus reflects what’s happening in Silicon Valley and not the global mobile phone industry. When Nokia was innovative, almost no one in the US knew about it because they couldn’t sell their products here (I’m told because of bad relations with AT&T — and of course their neglect of CDMA). Similarly, FT has tended to bias towards European telecoms — because that’s where its reporters and readers are; its coverage of Japanese and Korean innovation has been not much better than the Americans. Meanwhile, the Mobile Monday process by its nature is not going to pick the world’s most important innovations. MoMo wants to highlight up and coming firms, rather than established firms. And if there’s a MoMo chapter in the Republic of Elbonia, it’s going to nominate its best company and lobby for its recognition. So the truth lies in between the two extremes you’ve cited. What struck me most about the Fast Company list, wasn’t just that Nokia was excluded (despite the innovation of, say, Ovi Maps, the N900, low cost smartphones, and Comes With Music), but that many other non-US companies were excluded (eg Samsung, LG, MediaTek, Layar – to pick just a few). A 9:1 bias in favour of US companies is truly striking. I’ve no doubt that Silicon Valley is having a dramatic impact on the mobile industry. But it’s going to take me some time to come round to seeing a 9:1 influence factor.